The chip giant's commentary about near-term demand is encouraging for Apple and its chip suppliers, but a little less so for the broader chip industry. Investors in Apple (AAPL and its chip suppliers have reasons to be encouraged by Taiwan Semiconductor's (TSM earnings call commentary. For other chipmakers, the outlook given by TSMC, by far the world's biggest chip contract manufacturer (foundry), isn't as encouraging. However, there is a silver lining or two. On Thursday morning, TSMC reported Q3 revenue of NT$260.35 billion (up 3% annually and equal to $8.49 billion) and EPS of $0.56. Revenue, already disclosed via monthly sales reports, topped a guidance range of $8.28 billion to $8.38 billion (revised after an August computer virus attack briefly disrupted production). And EPS slightly beat a $0.55 consensus. However, TSMC also guided for Q3 revenue of $9.35 billion to $9.45 billion -- that implies 2% annual growth at the midpoint and was below a $9.52 billion consensus. On the call, CFO Lora Ho blamed "continued weakness in cryptocurrency mining demand and [notably] inventory management by our customers." On Thursday, TSMC shares fell 2.6% to $38.54, amid a 2.1% drop for the Nasdaq. Here are some thoughts on the implications of TSMC's outlook and commentary for some of its top customers, and for the chip industry at-large. Though it offered a below-consensus Q4 outlook, TSMC says this quarter's sales will get a boost "from the continuous demand of 7-nanometer [chips] for several high-end smartphones." To a large extent, that's a reference to Apple's A12 Bionic system-on-chip (SoC), which is found inside the iPhone XS and XR and relies on TSMC's just-launched 7nm process. The A12 will also probably be inside the new iPad Pros that Apple is expected to unveil at a just-announced event in New York City on Oct. 30. Huawei, another TSMC client, also recently launched high-end phones (its Mate 20 line) that feature a home-grown 7nm SoC (the Kirin 980). TSMC added that it's "continuing to increase 7-nanometer capacity to meet...strong customer demand." The comments come amid a number of signs suggesting that initial iPhone XS demand is healthy, at least outside of China. 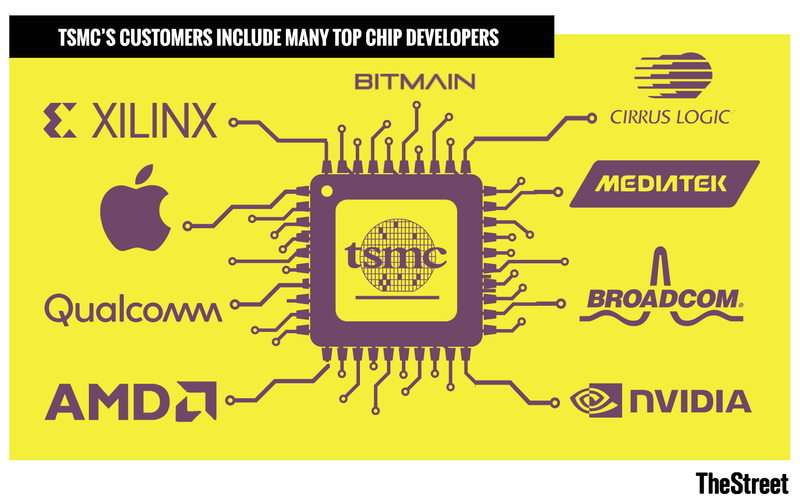 In addition to Apple, TSMC acts as a contract manufacturer to iPhone suppliers such as Cirrus Logic (CRUS and Broadcom (AVGO . Though TSMC's comments about crypto mining chip demand are technically bad news for Nvidia (NVDA and AMD (AMD , both companies have already forecast major drops in their crypto-related sales, with Nvidia stating on its July quarter call that it's "projecting no contributions" from crypto going forward. Would-be investors in top Bitcoin mining ASIC developer Bitmain's upcoming IPO should be more concerned. Meanwhile, Ho forecast that along with demand for 7nm smartphone chips, TSMC's Q4 sales will benefit from demand for newly-launched GPUs and AI processing chips that rely on TSMC's older 16nm and 12nm processes. That's partly a reference to Nvidia's new Turing-architecture gaming, workstation and server GPUs, which use a 12nm TSMC process. It's also probably a reference to products such as Alphabet/Google's (GOOGL third-gen Tensor Processing Unit (TPU), which is believed to have been developed with the help of TSMC client Broadcom. For its part, TSMC client Xilinx (XLNX recently unveiled AI-optimized 7nm chips based on its new ACAP platform; they're set to become generally available in the second half of 2019. TSMC's comments about client inventory adjustments come about a month after memory giant Micron (MU said it's seeing similar activity at select customers, as well as amid general concerns about a chip inventory correction following several quarters of strong industry growth. Notably, when asked on the call about inventory adjustments, Ho signaled that they'll continue into 2019, while suggesting the issue should be resolved by the second half of the year. Of course, at current valuations, a lot of cyclical worries have arguably been priced in -- at least provided that macro conditions don't significantly deteriorate. And in spite of the inventory correction, TSMC is forecasting that its 2019 revenue growth will be near the high end of a long-term target range of 5% to 10%. Moreover, when asked about the impact of U.S.-Chinese trade tensions -- a subject clearly on the minds of many chip stock investors -- on its sales to Chinese clients, TSMC indicated it's seeing little to no impact for now.